During Lent, we generally think about Jesus’ suffering and death. 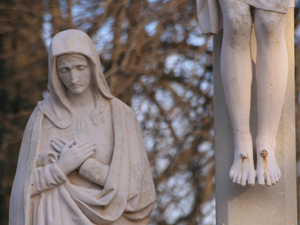 However, how often do we think about the suffering of his mother, Mary? A few days ago I stopped by the adoration chapel to ask Jesus what he wanted of me this Lent. The answer came back clearly: suffer and pray alongside the one who knew and loved Jesus the most: his Blessed Mother. Lent is a journey. Mary made the journey alongside Jesus during his earthly life. As his mother, she carried him in her womb and experienced the pain of Joseph planning to divorce her. She had no place to stay, but a stable when it was time for him to be born, then had to except putting her beloved baby Jesus in a manger for a crib. Mary trusted in God’s will for her Son, just as we need to trust in God’s will for our lives. She was just as human as we are, feeling physical pain, disappointment and all kinds of heartache. Yet, she had an intimate relationship with the Father, Son and Holy Spirit, so she must have turned everything over to them. Lent is a time to become more faithful disciples of our Lord. Mary was Jesus’ first and most faithful disciple. She stayed with him during every moment of His life. She was there at the scourging of Jesus at the pillar. During his walk to Golgotha, Mary followed his footsteps and was at the foot of his cross. In John’s Gospel we read about the disciples taking in Mary. “When Jesus saw his mother, and the disciple whom he loved standing near, he said to his mother, ‘Woman, behold, your son!’ Then he said to the disciple, ‘Behold, your mother!’ And from that hour the disciple took her into his own home.’ (John 19:26-27). By putting ourselves into Mary’s hands, she can help form us as a disciple. Mary learned to surrender her will to God’s will. From the moment the Angel Gabriel came to announce that she was to be the mother of Jesus, Mary said, “Let it be done to me according to thy word.” Lent is about learning to surrender our desires and trust in God. Meditating on the times in Mary’s life when she had to blindly trust shows me the way to trust. From the Annunciation, Nativity, Presentation, to the Wedding at Canna and finally with Our Lord’s Passion and death, Mary died to her desires and trusted in God’s plan. She, who loved Jesus most, teaches us how to love Christ more each day and to do whatever he tells us to do. I often think my life is filled with stress and chaos, until I look at the life of Mary and reflect on all the stress and chaos of her life even though she was the mother of God. Ultimately, the entirety of Mary’s discipleship of her Son was through her model of surrender. And so, there’s nothing better I can do this Lent than to surrender to Jesus and there’s no better teacher than his mother.